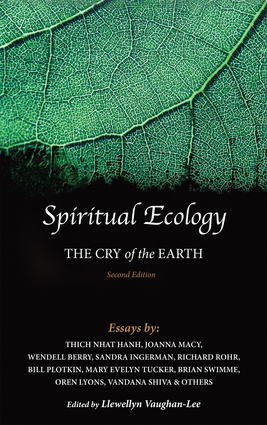 The first edition of this book fostered the emergence of the "Spiritual Ecology Movement," which recognizes the need for a spiritual response to our present ecological crisis. It drew an overwhelmingly positive response from readers, many of whom are asking the simple question, "What can I do?" This second expanded edition offers new chapters, including two from younger authors who are putting the principles of spiritual ecology into action, working with their hands as well as their hearts. It also includes a new preface and revised chapter by Llewellyn Vaughan-Lee, that reference two major recent events: the publication of Pope Francis's encyclical, "On Care for Our Common Home," which brought into the mainstream the idea that "the ecological crisis is essentially a spiritual problem"; and the 2015 Paris Climate Change Conference, which saw representatives from nearly 200 countries come together to address global warming, including faith leaders from many traditions. Bringing together voices from Buddhism, Sufism, Christianity, and Native American traditions, as well as from physics, deep psychology, and other environmental disciplines, this book calls on us to reassess our underlying attitudes and beliefs about the Earth and wake up to our spiritual as well as physical responsibilities toward the planet. Llewellyn Vaughan-Lee is a Sufi teacher who has lectured extensively throughout the United States, Canada, and Europe. He is the founder of the Golden Sufi Center and is the author of more than 15 books, including Alchemy of Light, Return of the Feminine and the World Soul, and Prayer of the Heart. Thich Nhat Hanh is the founder of the School of Youth Social Service, a relief organization that rebuilt bombed villages, set up schools and medical centers, resettled homeless families, and organized agricultural cooperatives after the Vietnam War. He was nominated for the 1967 Nobel Peace Prize. Joanna Macy is a scholar of Buddhism, deep ecology, and general systems theory. She lives in Berkeley, California. Wendell Berry is a conservationist, farmer, essayist, novelist, and poet. He is a former professor of English at the University of Kentucky and a past fellow of both the Guggenheim Foundation and the Rockefeller Foundation. He lives in Port Royal, Kentucky. Sandra Ingerman is a licensed marriage and family therapist (LMFT), and professional mental health counselor. She was awarded the Peace Award from the Global Foundation for Integrative Medicine in 2007. She lives in Santa Fe, New Mexico. Richard Rohr is a Franciscan priest and founder of the Center for Action and Contemplation. He lives in Albuquerque, New Mexico. Bill Plotkin is a depth psychologist, wilderness rites guide, and ecotherapist. He lives in Durango, Colorado. Mary Evelyn Tucker is a senior lecturer and research scholar at Yale University where she holds appointments in the Divinity School and in the School of Forestry and Environmental Studies. She lives in New Haven, Connecticut. Brian Swimme is the director of the Center for the Story of the Universe and a professor at the California Institute of Integral Studies. He lives in San Francisco. Vandana Shiva is an environmental leader, and recipient of the 1993 Alternative Nobel Peace Prize.